In gardening, the early landscape garden was a phenomenon of the English country house which depended on classical literature and imagery for its poetic and pictorial approach. Garden designers in Britain looking to underline what Pope termed the true “genius of the place” by turning to the ‘idyllic images of the Roman campagna’ as evoked by painters Claude Lorrain and Nicholas Poussin in seventeenth-century French landscape painting (fig. 3). The Roman Campagna (1639), Claude Lorrain, Metropolitan Museum of Art. This combined the elements of the idealised vista with the pastoral, incorporating ‘Palladian pavilions’ and rustic follies to recall a mythic Arcadia and golden age. First and foremost, the anti-royalist sentiment stirred by Whig politics prompted a new type of patronage, born from classical education and an enlightened pattern of thought. Large country estates, such as those belonging to Richard Temple (1st Viscount Cobham), Richard Boyle (3rd Earl of Burlington) and banker Henry Hoare engaged the services of William Kent and Charles Bridgeman to map out Italianate landscapes, vistas of Roman ruin and recollections of the Grand Tour across the English countryside (fig. 4). 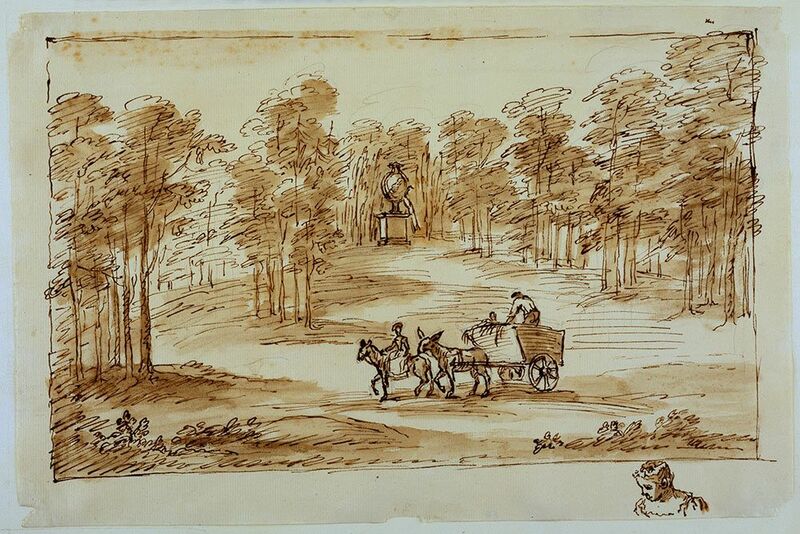 Landscape at Chiswick (c. 1733-38), William Kent, pencil, pen and ink. The great acclaim of landscapist Capability Brown was based on his ability to execute gardens as a poet or composer might, citing those at Petworth, Chatsworth, Bowood and Blenheim as panoramic exemplars of this variety (fig. 5). Aesthetically and culturally, Dabney Townsend observes the ‘growing taste for natural beauty and scenic touring’ in the 18th century and how ‘natural scenery entered into and continued increasingly to occupy both the visual and literary arts’. 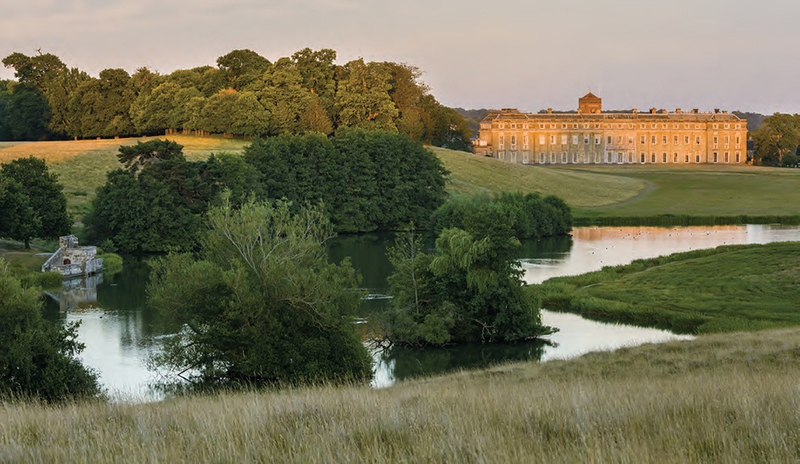 View of Petworth House, Landscape and Water Bend, Capability Brown. Naturally this sparked further debate in landscape gardening which looked to evoke the ‘Picturesque’, a conversation best charted in publications and criticism throughout the 18th and 19th centuries. As Hazel Fryer writes: ‘the picturesque style of design has been open to a variety of different interpretations’ and, it became a contentious issue in the aesthetic theories of Uvedale Price and Richard Payne Knight, whose gardens at Foxley and Downton worked to express Picturesque ideals according to the formulation of each. Conceptually, their views differed: Price sought to integrate the ‘Picturesque’ as a third category to Edmund Burke’s ‘Sublime’ and ‘Beautiful’, thus establishing the picturesque as an objective and abstract concept. This, in contrast to Burke’s description of the ‘Beautiful’ as ‘smoothness and gradual deviations’ would define the ‘Picturesque’ as ‘all rough objects and abrupt deviations’. Here, Price stressed that in ‘picture-making with the materials of nature’, appreciation for these forms came intrinsically from the objects themselves. Price equated gardening with painting concerning the ‘general composition, grouping the separate parts, harmony of tints, unity character, [and] breadth and effect of light and shade’ and encouraged that ‘trees, buildings, water, etc.,’ ought to ‘be disposed, grouped, and accompanied in the most beautiful and striking manner’. 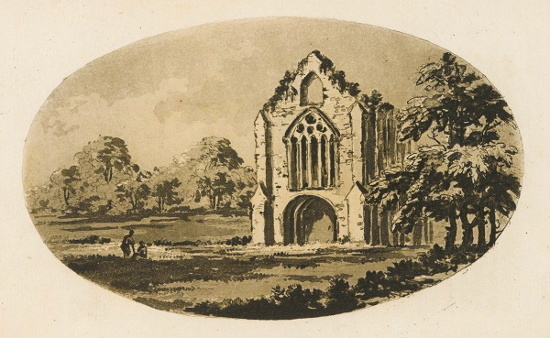 Tintern Abbey (1782), William Gilpin, Sketch. In comparison, Knight chose to develop the ‘Picturesque’ as a subjective theory of association and to provide grounds for this ‘sensibility’ being equated with ‘real taste’. Philosopher Archibald Alison had been keen to prove the ‘connexion between taste and sensibility’ and to validate ‘emotions of taste’ and Knight follows in this vein of sanctioning the emotions through a deeply philosophical background. Knight objected to Price’s definition of the ‘Picturesque’ stating that Price’s ‘great, fundamental error’ was ‘seeking for distinctions in external objects which only exist in the modes and habits of viewing and considering them’. Philosophically speaking, this statement attributes the ‘Picturesque’ to the mind, ideas and association. These differing interpretations of how the ‘Picturesque’ was to be received highlight problems of definition, however, they both contend with a ‘ruggedness’ previously absent from the character of the English landscape garden. Repton’s Before and After sketches (Wikipedia). Against the backdrop of this debate in the ‘Picturesque’, Humphrey Repton was a leading landscapist and his services were engaged at six estates in Herefordshire between 1791 and 1795, providing consultation, advise and the execution of altered plans. Red Books were produced under Repton as mock ups for the country houses Garnons, Stoke Edith and Sufton, contrasting ‘before and after views’ (fig. 7) in the manner of a visionary. Here, to a degree, we can see the practical application of ‘Picturesque’ principles, according to existing sites: Supporting this, Repton’s stated that ‘the great object is to give the ground near the house an appearance of dress and appropriate it to the mansion’. With this aim in mind, Repton’s approach to applying the ‘Picturesque’ was tailored, calculated and did not always adhere to the ideals of Price and Knight. For example, at Ferney, Repton ‘proposed a variety of improvement […] In the view from the front rooms he presented a smooth parkland style of design’ known as the ‘dressed park’ and the ‘formal terraces’ were ‘to be replaced by an informal landscape’. Here, Repton is seen to advocate numerous design styles compared to a consistently ‘Picturesque’ approach, with the ‘view from the drawing room’ described to be ‘more picturesque in character’ (fig. 8). The View from the drawing room window before improvements, Repton, Ferney, Pierrepoint Morgan Library. Another garden undertaken by Repton at Warley balanced the ‘Congruity, Utility, Order and Symmetry’ expected from the classically formal landscape with the ‘Picturesque Effect’ which was understood and defined according to the ‘breadth of light and shades, forms and groups, outline and colouring, balance of composition and occasional advantage from roughness and decay, the effect of time and age’. In this way, Repton does not use the ‘Picturesque Effect’ as the central design philosophy: By a narrower aesthetic definition, Repton appropriates the theory to his own ends as a landscape gardener. He takes the painterly aspects of handling the middle ground, framing and compositional elements across the landscape in order ‘to appropriate the distant views beyond the park’. Such a calculated approach aligns with Repton’s argument that the land owned by the majority of his clients was not as ‘rugged’ as those proposed to fully achieve the picturesque effect. Repton takes on ‘the new system of Improvement by Neglect and Accident’, but chooses to be flexible in his approach to landscape gardening: Such amenability allowed Repton’s conception to flourish and be practised the length of England. The View from the drawing room window after improvements, Repton, Ferney, Pierrepoint Morgan Library. The ‘Picturesque’ in terms of landscape gardening is therefore part on an evolving theory in the history of garden design. Conceived as a more romantic notion, this particular style of country house garden moves from a classical and rigid model to greater informality and artistic freedom in arrangement using nature. As we’ve seen, a consistent definition fails to emerge, however, the agreed outcome of the ‘Picturesque’ in gardening is one extolling painted values and natural beauty. J. Hunt and P. Willis, The Genius of the Place: The English Landscape Garden, 1620-1820 (MIT Press, 1988), p. 206. T. Mowl, William Kent: Architect, Designer, Opportunist (Random House, 2007), p. 234. D. Townsend, ‘The Picturesque’, The Journal of Aesthetics and Art Criticism, Vol. 55, No. 4, 1997, p. 365. M. Batey, ‘The Picturesque: An Overview’, Garden History, Vol. 22, No. 2, 1994, p. 121. S. Copley, The Politics of the Picturesque: Literature, Landscape and Aesthetics Since 1770 (Cambridge University Press, 1994), p. 86. H. Fryer, ‘Humphry Repton’s Commissions in Herefordshire: Picturesque Landscape Aesthetics’, Garden History, Vol. 22, No. 2, 1994, p. 162. D. O’Neill, The Burke-Wollstonecraft Debate: Savagery, Civilisation and Democracy (Penn State Press, 2010), p.133. U. Price and T. Lauder, Sir Uvedale Price, On the Picturesque (Caldwell, Lloyd, 1842), p. 460. S. Evans, Masters of their Craft: The Art, Architecture and Garden Design of the Nesfields (The Lutterworth Press, 2014), p. 45. S. Ross, What Gardens Mean (University of Chicago Press, 2001), p. 131. A. Bermingham, Landscape and Ideology: The English Rustic Tradition, 1740-1860 (University of California Press, 1989), p. 71. A. Alison, Essays on the Nature and Principles of Taste (George Goodwin & Sons, 1821), p. 77. T. Costelloe, The British Aesthetic Tradition: From Shaftesbury to Wiggenstein (Cambridge University Press, 2013), p. 168. M. Clarke, The Arrogant Connoisseur: Richard Payne Knight, 1751-1824: Essays on Richard Payne Knight Together with a Catalogue of Works Exhibited at the Whitworth Art Gallery, 1982 (Manchester University Press, 1982), p. 85. Fryer, ‘Commissions in Herefordshire’, pp. 162-163.